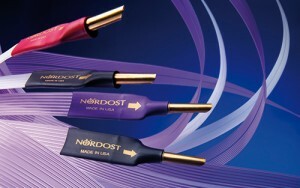 Nordost’s entry level cable ranges are perfect examples of quality cabling set at an affordable price range. The Leif family uses scientifically proven methods and technology derived from the development of our Valhalla and Odin ranges and applies their basic principles to create cables which evoke dynamic, low-loss and realistic performances from even modest components and Loudspeakers. Leif cables are constructed using silver-plated, OFC solid core conductors, which form the basis of Nordost’s great sound. The conductors are then treated with Nordost’s innovative precision FEP extrusion process, where each conductor is individually enclosed in FEP insulation. This technique greatly reduces the dielectric properties of the cables in order to increase signal speeds and accuracy in signal transfer. To build upon this foundation, Leif cables are designed with a mechanically tuned construction that optimizes the dimensions and spacing of conductors to reduce dielectric effects even further. Finally, the Leif family benefits from the use of proprietary connectors, which provide a sonically consistent connection and complete Nordost’s impressive first tier of cables. Capable of releasing astonishing performances from even modest electronics and speakers. If you want to sum up the performance goals of a good audio interconnect, then, “Nothing added, nothing taken away” does a pretty good job. What most people don’t appreciate is just how succinctly that sums up the required physical construction too! Leif’s minimalism extends to the choice of connectors. Nordost selected the best, most reliable and sonically consistent, low-mass plugs for the Leif Series. After all, why eliminate unnecessary extra material from the cable and then simply throw away the benefits by using connectors that are over-engineered and overweight? Instead, each Leif interconnect, from the White Lightning to the Red Dawn, is a carefully studied exercise in high-performance minimalism, form focused unerringly on function. The safe transfer of digital data streams depends absolutely on achieving accurate impedance within the transmission chain. The S/PDIF transmission standard dictates a 75 Ohm co-axial lead, but it is surprising how few cables meet that specification.The Blue Heaven digital interconnect is a true 75 Ohm conductor. Employing a micro mono-filament, co-axial construction, this advanced topology allows us to achieve superior electrical performance and geometrical accuracy irrespective of cable length. The high-speed, low-loss characteristics of the virtual air dielectric, combined with the superior mechanical behavior of the MMF cradle minimize cable echoes and reflections, while the use of BNC termination ensures that the 75 Ohm standard is maintained, even across the connectors. Each Blue Heaven digital interconnect is supplied with a pair of true 75 Ohm BNC to RCA adaptors, making the cable consistent in performance across any combination of co-axial output or input socketry – and future proof to boot. Changing your DAC or transport will no longer mean having to change your digital interconnect too. High quality Ethernet cables are the key to achieving a suitable interface when connecting first-rate AV components to a home network. 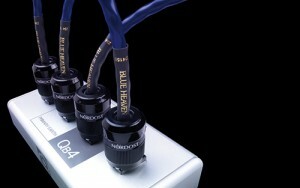 The Blue Heaven Ethernet Cable is the solution that digitally-driven hifi enthusiasts have been waiting for. This groundbreaking cable allows Network Attached Storage (NAS) devices and music streaming to be fully integrated into a hifi system, while improving its sonic performance. In order to perfect their Ethernet cable design, Nordost has employed technologies and methods proven effective throughout the years in the consumer electronics industry and modified them to fit this new, highly specified market. 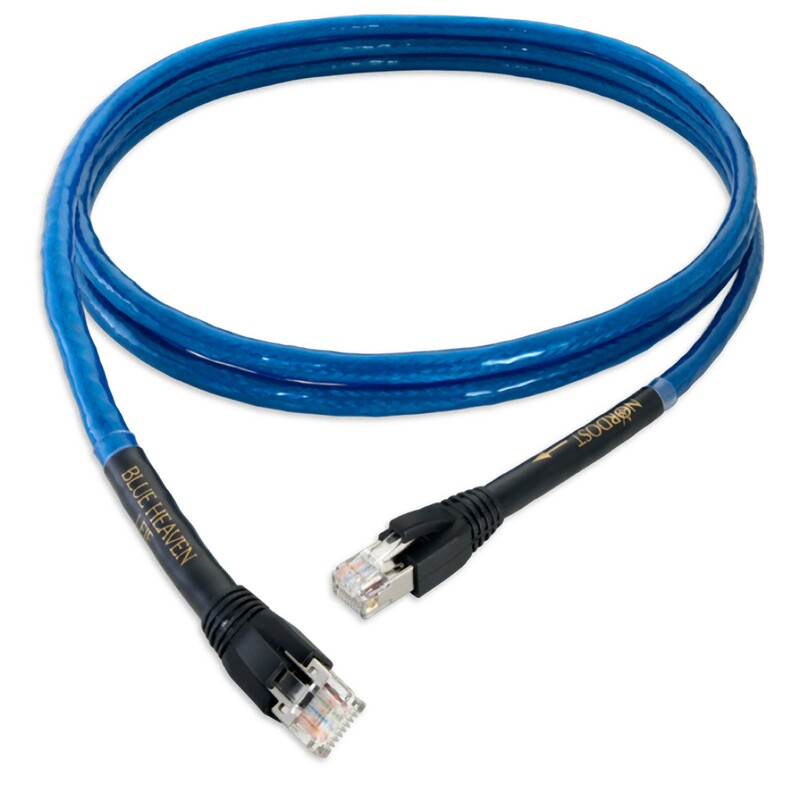 The Blue Heaven Ethernet Cable is comprised of eight, 24 AWG, polymer insulated, solid core copper conductors, arranged in a twisted pair design. These pairs are individually shielded before the bundle is wrapped in two additional layers of braided shielding. 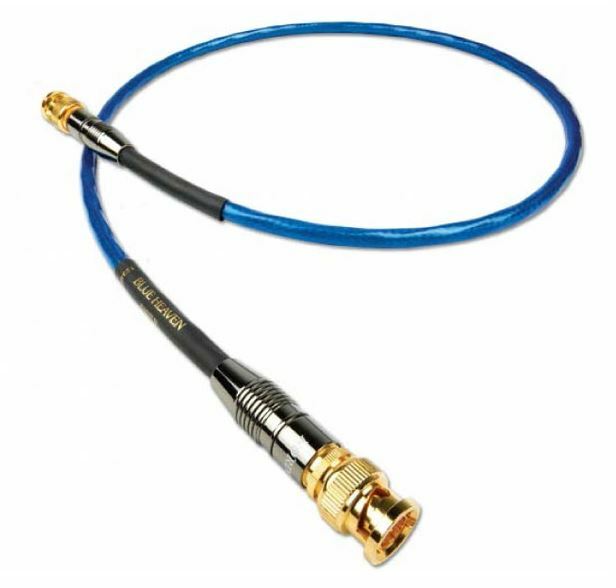 This screened foiled twisted pair (s/ftp) design fully eliminates cross-talk while improving noise resistance and maintaining the integrity of data files being transferred over long distances. Provided with factory-terminated, shielded 8P8C/RJ45 connectors, this cable assures that no loss is incurred in the field. The Blue Heaven Ethernet Cable is designed, manufactured, and terminated in the USA. Each cable is constructed with the quality of fabrication, precision and consistency needed to ensure a guaranteed improvement over standard issue, mass-produced, low precision Ethernet cables. 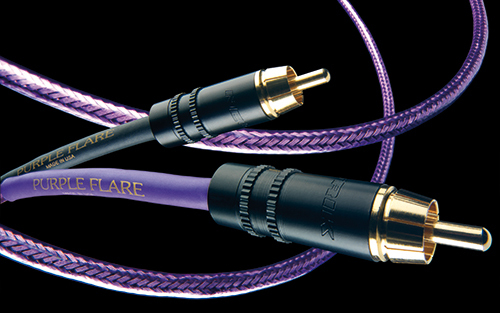 When Nordost launched the original Flatline speaker cable, its unique, extruded FEP construction delivered a combination of minimal capacitance, inductance and dielectric effect that, combined with the quality of the materials employed, produced a lightning fast, low-loss performance that brought music to life. Now, that original design has evolved even further. The Leif Series speaker cables represent a significant evolution in the Flatline story. Retaining the essential engineering elegance of the original design, experience has taught us how to extract even greater performance from a deceptively simple recipe, a benefit you’ll hear in the musical performance of your system. 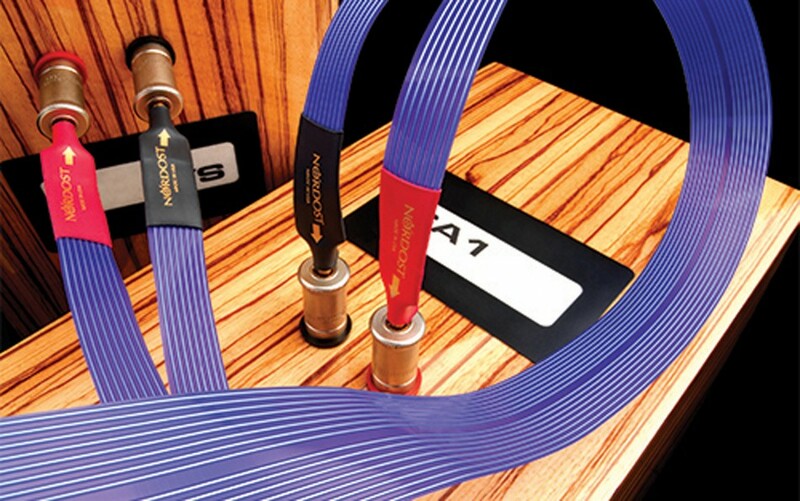 Cables like Nordost’s supreme reference, the Odin, have thrown open a new window on system performance, revealing the critical part played in musical reproduction by superior power cords. Why? Because the AC supply is, quite literally, delivering the raw material from which your system will recreate the recorded musical performance. And just like a sculpture, the texture and quality of that raw material has a profound effect on the finished article. In recognition of this crucial role, we have employed our proprietary Micro Mono-Filament construction throughout the power cords in the Leif Series. The tiny signals generated by pick-up cartridges, especially modern moving-coils, can be between 500 and 5000 times smaller than the average output of a CD player. Such fragile signals demand purpose built, low-capacitance cables if the finest details and textures are to escape smearing and loss. Low capacitance is a central aim of Nordost’s high-speed minimalist construction, but a tonearm lead demands more, with comprehensive shielding and grounding essential to optimum performance. 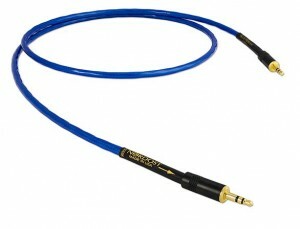 The Blue Heaven tonearm cable delivers exactly the low-loss electricalcharacteristics required, combined with effective shielding, dual grounding and a full range of termination options in both single-ended and balanced configurations, allowing you to specify exactly the topology required to liberate the musical performance locked in the grooves on your LP collection. It’s position, right at the start of the signal chain, and the fragile nature of the signals it carries make it doubly critical, but deliver a double performance benefit when you get it right. 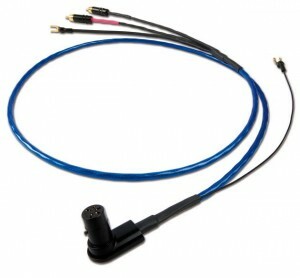 With the Blue Heaven tonearm cable, now there’s an affordable way to hear what’s really on your records.